Although I am not much of a lip gloss lover (lipstick girl all the way! 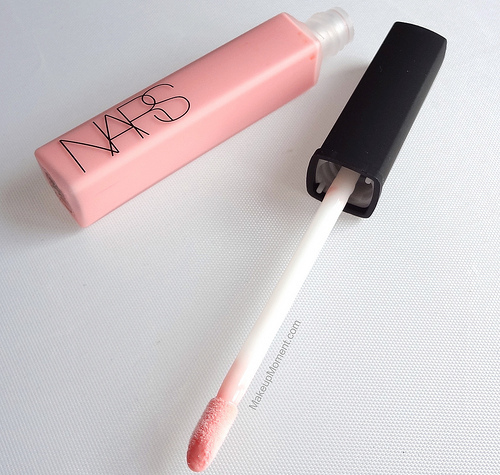 ), there is just something about Nars' Turkish Delight Lip Gloss ($24.00) that always intrigued me. I think it was the milky pink coloring that had me in awe, since I am one who can never seem to resist pink lip colors. A few weeks ago, I finally caved and purchased a tube of Turkish Delight, over at Sephora. Turkish Delight comes housed in a sleek looking tube, and contains an angled sponge-tip applicator. I do detect a fragrance to this gloss. Those who are particular to scents probably won't find this one very pleasant. It smells like plastic or something of the sort. Luckily the scent isn't too overwhelming and it does dissipate after awhile. Turkish Delight imparts a semi-sheer, pale pink tinge to lips and although lovely sported on it's own, I think this lip gloss makes a much better layering gloss. It adds a really pretty, shiny finishing touch to lip colors that contain similar pink hues. If worn atop bare lips, I suggest properly prepping the lips before application as this gloss does have a tendency to enhance any flaky or dry bits. Also, try not to over apply this gloss in order to avoid it settling into lip lines. This gloss has a smooth formula that simply glides on the lips. It feels weightless on, and sits comfortably on the lips. I am not very fond of lip glosses that are on the sticky side but, I know that the sticky texture is an asset that helps prolong wear time. Because this gloss doesn't have much of a sticky base, the lasting power is inevitably shortened. I get about 2-3 hours wear before I have to reapply again. Overall: I think Turkish Delight is a pretty nice lip gloss. It makes a great layering gloss and the smooth consistency is a dream. But, I don't think I am going to shell out another $24 to repurchase once I am done using up this tube. Unfortunately, Turkish Delight didn't really wow me as much as I thought it would. I think I can find a similar lip gloss to this one for a fraction of the cost. I do plan on trying out other Nars lip glosses in the near future, though. I have my eye on Belize for next time! What do you all think of Turkish Delight Lip Gloss from Nars? Which are your favorite Nars lip glosses? Yet to try any products from Nars yet! Although i am enticed by their foundation or a eyeshadow duo! In terms of this raved after shade, I dont go for such pale pinks, I find they wash me out! They work very well on those with a good tan or who are pale, i'm in between! I ve always wanted to try this, and then I forgot it, but now you reminded me that I have to try it! Let me know how you feel about it when you try it! 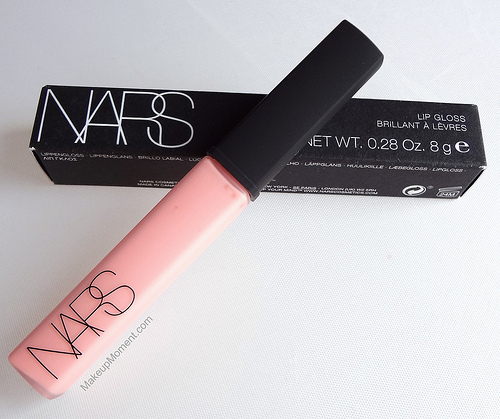 :) Have you tried other Nars lip glosses before?